MOUNTAIN HOME, Idaho — The U.S. Air Force is facing a lawsuit that seeks to halt proposed training exercises over nine cities in southern Idaho, according to court documents. Those cities include Boise, Mountain Home, Burley, Twin Falls, Grand View, Bruneau, Glenns Ferry, Hammett, and the Mountain Home Air Force Base. The complaint was filed Monday in the U.S. District Court of Idaho by seven Boise residents and an environmental organization called Great Old Broads for Wilderness, which is a non-profit group that works to preserve public lands. The lawsuit lists potential hazards the program could cause and says the Air Force did not do enough to inform the public or municipalities about its plans. According to the complaint filed in court, the training "endangers the health, safety, and quality of life of Idahoans, as well as birds and wildlife." "We're also challenging a lack of environmental review," Sarah Stellberg, an attorney with Advocates for the West, who filed the lawsuit, said. According to the environmental assessment done by the Air Force in November, "no significant impact" was found on noise, air quality, airspace management, land use, health or safety. The report stated that "all activities were found to comply with the criteria or standards of environmental quality and were coordinated with the appropriate federal, state and local agencies." The proposed training could include up to 160 training events per year. The training would involve aircraft flying over Idaho towns and cities and communicating with service members dressed as civilians on the ground to identify targets with low-power lasers, military officials have said. They stressed the need for training in city settings to simulate "urban environments encountered in combat." In response to residents' concerns about lasers, the Air Force said, the lasers "would not be hazardous to the eye." Residents also feel they weren't given enough notice or information about the project. “When I first heard about it I had several questions and I still have many questions that remain unanswered about this proposal,” Anne Hausrath, a Boise resident. "I don't feel they've done enough to convince me they've looked at other alternatives." In the court complaint, it also states that noise levels are a concern to residents. According to the Air Force, this training would be done at a significantly high altitude. "When we do execute this training, we'll be more than 10,000 feet above the ground, which is more than two miles up," said Maj. Dave Bervig, an F-15E pilot with the 366 Fighter Wing. 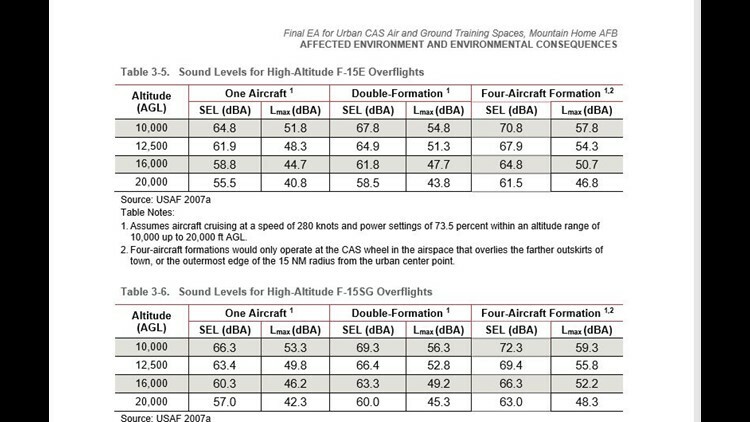 In the environmental report done by the Air Force, it compares decibel levels of sound. 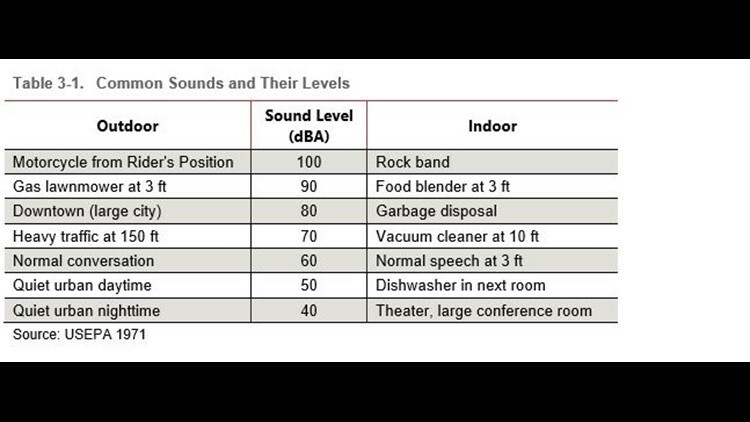 According to the reports, the dBA is the level at which a person on the ground would be able to hear something. It gives examples such as a theater, which has a frequency of about 40 dBA. An indoor rock concert or a motorcycle as heard from the rider's position would sound at about 100 dBA. In comparison, the Air Force reports show the highest dBA an F-15 would hit, would be during a four-flight formation and would reach about 59.3 dBA. Stellberg said the Air Force also did not respond to several public comments about the project, which she says it is required to do by law. Under its CAS documents on its website, the Air Force lists hundreds of pages of comments from the public, and the response to them. Bervig said this type of training is necessary because it prepares troops for all types of situations and barriers, including tall buildings. That hands-on training is what Air Force troops rely on in combat. Bervig added that the Air Force would not do harm to its nearby communities. “We’re honored to live and serve in the state of Idaho," he said. "We’re very appreciative of the positive relationship we have with the community in the State of Idaho, in the Treasure Valley." Stellberg said the lawsuit is asking the court to halt the training and not allow it to continue unless the Air Force can provide more public involvement and awareness, as well as a proper impact study, as required by law.